This 4 Disc set plus Class notes is the content from our 4 weekTelecourse. The course focuses on understanding operant conditioning, with abundant applied examples. You’ll learn how to more be more successful using positive reinforcement and negative punishment to effect behavior changes. Other types of learning will also be discussed, and under what circumstances they may be more important than operant conditioning. If you’ve gotten stumped by variations between other authors’ coverage of learning principles, or are confused about how to apply what you know, this course if for you. 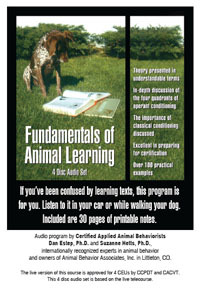 Listening to the CD version of Fundamentals of Animal Learning has been approved for 1 CEU. However, to receive CEU credit you MUST attend this 1-hour discussion group in addition to listening to the sessions on CD. The discussion group is also approved for 1 CEU, so you would receive a total of 2 CEUs for listening to the CDs and attending the discussion group. If you've purchased the CD's and desire CEU credit, please register for the discussion group below.